POTOMAC, Md.—A narrow, two-lane street winds between columns of oak trees and hills of sun-drenched wilderness. Orange, yellow and crimson leaves are strewn about the cracked, gray cement. 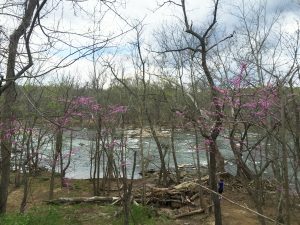 The serene, but inconspicuous, woodland landscape leading up to the C&O Canal makes the Chesapeake & Ohio Canal National Historical Park quite literally a hidden gem. The average passerby would hardly expect that one of Washington D.C.’s foremost attractions was a mere thousand feet down the road. 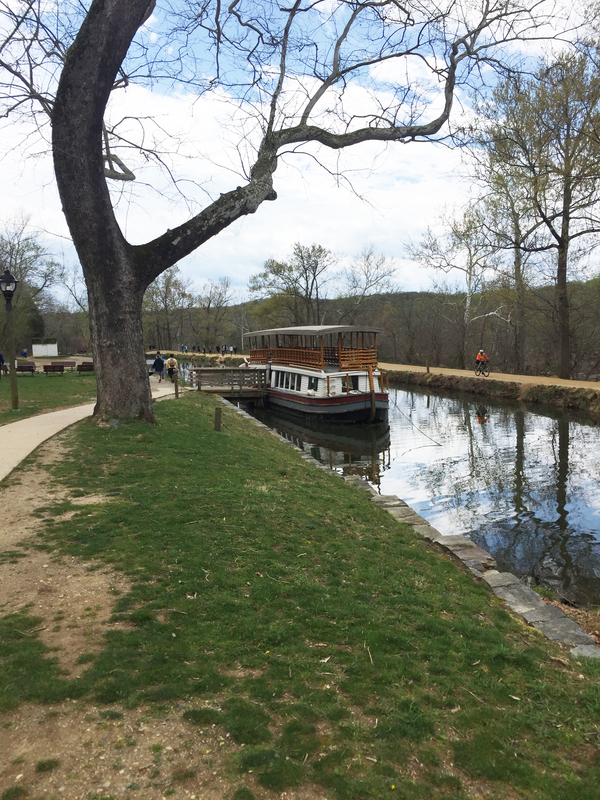 The history of the C&O Canal spans three centuries and runs deeper than the waterway itself. On July Fourth, 1828, to the sound of applause, clinking glasses and a marching band, President John Quincy Adams broke ground for the C&O Canal. His goal was to create a navigable waterway connecting Georgetown to the Ohio River. His aspirations proved too lofty. By the time construction ended in 1850, the canal was far short of reaching the Ohio River. Canals had become obsolete and the Baltimore & Ohio Railroad had completed the link to the West. Still, between 1828 and 1850, thousands of immigrants found work building the canal. In the early 1900s, hundreds of families worked and traveled along the canal during America’s westward expansion. Before children were old enough to work on the canal, parents would chain them to canal boats to keep them from running away or jumping off. In 1971, U.S. Supreme Court Justice William O. Douglas led a successful campaign to persuade Congress to establish the C&O Canal as a national historical park. Now, the canal serves as a tourist hub, with hiking trails along the Potomac, bike paths alongside the water, campgrounds, and mule-drawn boat rides. Yes, boats pulled by mules. 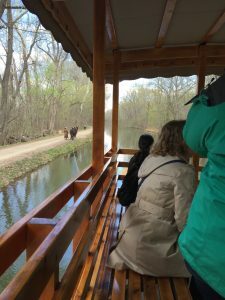 At the Great Falls Tavern Visitor Center in Bethesda, Md., visitors can purchase a ticket to ride a canal boat pulled by four mules, two on each side of the canal. At breakneck speeds up to three miles-per-hour, the canal boat is Washington, D.C.’s slowest thrill ride. But what the ride lacks in wind-whipping speed, it makes up for with the unique experience of being on-board while the boat is raised and lowered in one of the canal’s 74 lift locks. The lock is like a giant bathtub and the canal boat is like a rubber duck. In order to raise the boat, water is pumped in, and vice versa to lower the boat. The view from the inside of a canal boat. The canal ride is hardly the C&O Canal’s only hands-on glimpse into colonial life. Visitors can actually stay overnight in a lockhouse. Even for the non-history buff, the C&O Canal is a tree-lined pastoral haven for anyone seeking a reprieve from the hustle and bustle of everyday life. Though the C&O Canal is not on most people’s short lists of must-see historical attractions in the D.C. area, most visitors leave with lasting memories. There are seven visitor centers along the 185-mile canal. Great Falls Tavern Visitor Center (only location that offers canal boat rides): 11710 MacArthur Blvd., Potomac, Md. ; 301-767-3714. Georgetown Visitor Center: 1057 Thomas Jefferson St. NW, Washington, D.C.; 301-767-3714. Brunswick Visitor Center: 40 W. Potomac St., Brunswick, Md. ; 301-834-7100. Ferry Hill Visitor Center: 16500 Shepherdstown Pike, Sharpsburg, Md. ; 301-582-0813. Williamsport Visitor Center: 205 W. Potomac St., Williamsport, Md. ; 301-582-0813. Hancock Visitor Center: 439 E. Main St., Hancock, Md. ; 301-582-0813. Cumberland Visitor Center: Western Maryland Railway Station, 13 Canal St., Cumberland, Md. ; 301-722-8226. Hours and days of operation vary by season, so please visit www.nps.gov/choh or call for schedules.